SURIBACHI | Down to Earth Distributors, Inc.
Our Japanese made Suribachis come in a variety of sizes and colors from classic cobalt to brown or black. These beautiful bowls will certainly be more aesthetically appealing on your countertop than bulky kitchen electrics, not to mention you'll look like a master chef with one of these tools proudly displayed in your kitchen. 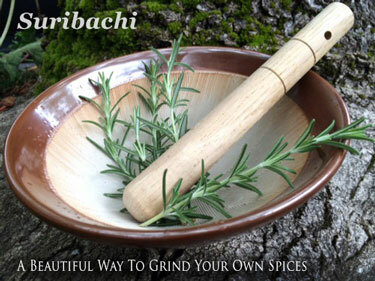 Whether you've got a raw or paleo diet, or you just want to grind your own spices without the worry of a blade, a Suribachi is one of the most useful novelty items you'll ever own. suribachi grn w/bl dfly 5.75"